It was October last year when Ed surprised me with an overnight stay at the tallest hotel in the world. He is not a big spender, but I usually get super spoiled during special occasions. And during that time, we were celebrating our 4th wedding anniversary. Just a little trivia, the Top 4 tallest hotels in the world are all located in Dubai! Awesome, right? The most staggering of them all, JW Marriott Marquis, is a 1,100 ft twin-tower business hotel. It is impressively standing along Sheikh Zayed Road, cladded in blue glass panels and crowned with a striking design at the topmost floor! JW Marriott Marquis is located in Business Bay, a few minutes drive from The Dubai Mall. It is the tallest luxury hotel, yet it embraced a minimalist approach in the lobby. 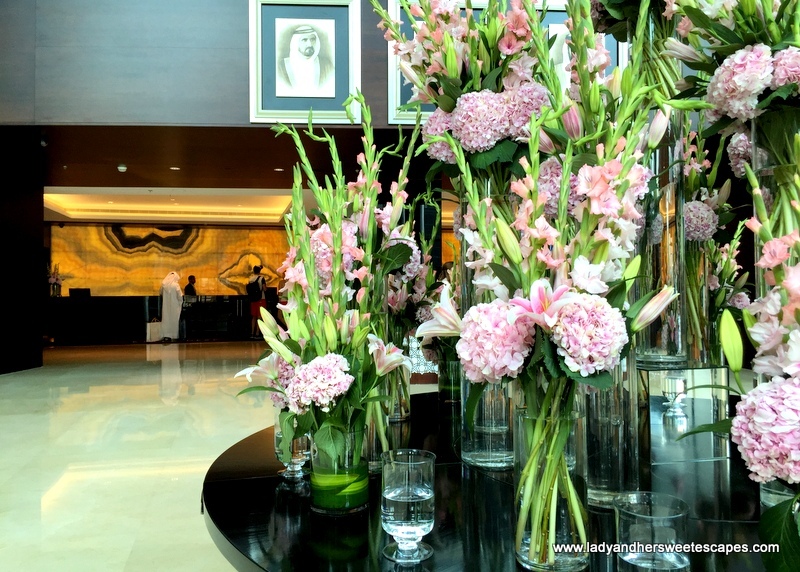 No extravagant pillars and chandeliers like Burj Al Arab, just a huge table topped with fresh flowers and a tastefully arranged rainbow-colored liquor bottles in the lobby lounge. 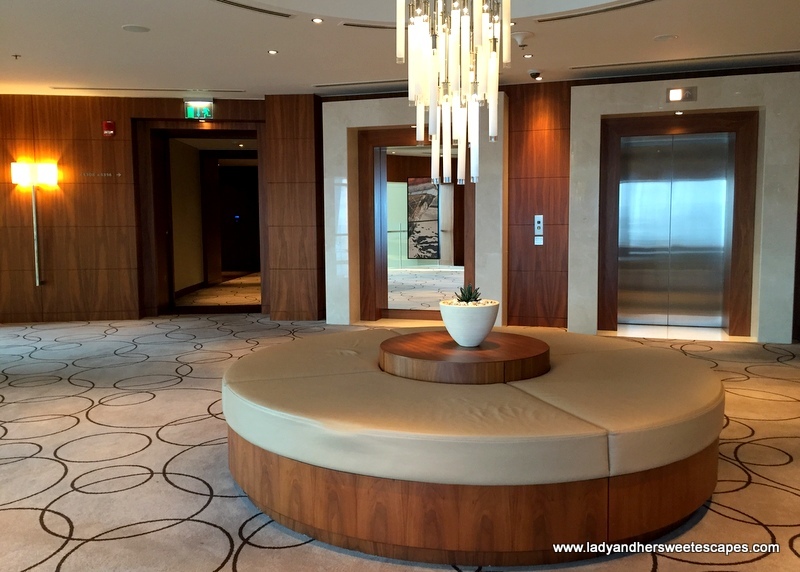 It was a weekend when we stayed at JW Marriott Marquis Dubai. There was a short queue at the check-in counter, yet everything was organized that we were able to get our room key in no time. JW Marriott Marquis Dubai has 72 floors with over 1,600 guest rooms! Ed booked the standard room, but when the receptionist knew that we are celebrating our wedding anniversary, we were upgraded to a Sea View room in the 43rd floor. We had a spectacular view of the coastline, quite a blurry glimpse of The World islands since it's quite far, and a bird's-eye view of the on going Dubai Canal construction. Beyond the upgrade, the staff also added a zing of romance to our anniversary celebration. A chocolate cake and a greeting card welcomed us in the room. The king size bed was decorated with rose petals and the posh bath tub was almost ready for a romantic bubble bath! So girl, hint hint, inconspicuously tell your guy that he can actually inform the hotel ahead that you are celebrating something special. Most hotels will make your stay more memorable. :) My husband knows the drill already, so I don't have to make paramdam. Hahah! Bubble bath with sweet-smelling rose petals? Yes please! JW Marriott Marquis has a full service spa, a fitness center, and an outdoor swimming pool. It was the latter that we loved the most! The pool area is like a mini-resort in the midst of futuristic skyscrapers! Burj Khalifa and bizarrely shaped towers at Business Bay can be seen from the pool deck. JW Marriott Marquis Dubai is a home to popular signature restaurants. We were able to try three of them during our stay. For lunch, we opted to dine in our room. We called Positano for food delivery and in less than an hour, a staff arranged a table for two beside our bed and topped it with authentic Italian pizza and hand crafted pasta! If lunch was Italian, dinner was Peruvian! We had a wonderful time at the Garden, a Peruvian restaurant tucked in the 5th floor. 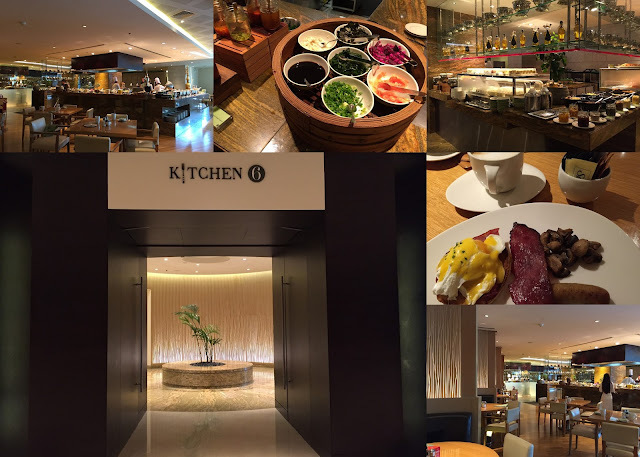 Read about our dining experience here: Peruvian Dinner at the Garden in JW Marriott Marquis. Our stay came with a complimentary breakfast at none other than the famous buffet restaurant, Kitchen 6. Breakfast was huge! There are Asian dishes, European fare, Middle Eastern specialties and all the breakfast basics! The options were spread in different counters which I found really good as every diner gets the chance to conveniently sit beside a buffet section. JW Marriott Marquis Dubai gets an excellent rating in our books! Thumbs up for the extra-special service. Yey for the amenities. And a big fat foodie hooray for the dining options!